You thought there were two kinds of medicine correct, the "quack" kind, and the evidence-based kind. Dr. Eric Topol presents a case for a third kind of medicine. "Topol argues in The Creative Destruction of Medicine [Basic Books, 9780465061839] it's by bringing the era of big data to the clinic, laboratory, and hospital. Wearable sensors, smartphone apps, and whole-genome scans provide the raw materials for a revolution. Combining all the data those tools can provide will give us a complete and continuously updated picture of every patient, changing everything from the treatment of disease, to the prolonging of health, to the development of new treatments. As revolutionary as the past twenty years in personal technology and medicine have been, Topol makes it clear that we haven't seen a thing yet." 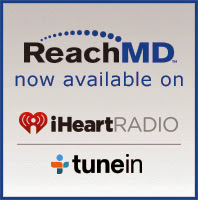 "Dr. Brian McDonough welcomes Dr. Eric Topol, Scripps Health Chief Academic Officer and Editor-in-Chief of Medscape, to discuss on ReachMD the vision and research behind his book The Creative Destruction of Medicine. Dr. Topol reflects on the evolving personalization of medical care facilitated by technological advancements, and how health systems can leverage the personalized medicine movement toward greater transparency in care for patients."